Social cost in neoclassical economics is the sum of the private costs resulting from a transaction and the costs imposed on the consumers as a consequence of being exposed to the transaction for which they are not compensated or charged. In other words it is the sum of personal and external costs. Private costs refer to direct costs to the producer for producing the good or service. Social cost includes these private costs and the additional costs (or external costs) associated with the production of the good for which are not accounted for by the free market. Mathematically, social marginal cost is the sum of private marginal cost and the external costs. For example, when selling a glass of lemonade at a lemonade stand, the private costs involved in this transaction are the costs of the lemons and the sugar and the water that are ingredients to the lemonade, the opportunity cost of the labor to combine them into lemonade, as well as any transaction costs, such as walking to the stand. An example of marginal damages associated with social costs of driving includes wear and tear, congestion, and the decreased quality of life due to drunks driving or impatience.a large number of people displaced from their homes and localities due to construction work. According to the International Monetary Fund, "there are differences between private costs and the costs to the society as a whole". In a situation where there are positive social costs, it means that the first of the Fundamental theorems of welfare economics failed in that relying merely on private markets for price and quantity lead to an inefficient outcome. Market failures or situations in which consumption, investment, and production decisions made by individuals or firms result in indirect costs i.e. have an effect on parties external to the transaction are one of the most common reasons for government intervention. In economics, these indirect costs which lead to inefficiencies in the market and result in a difference between the private costs and the social costs are called externalities. Thus, social costs are the costs pertaining to the transaction costs to the society as a whole. Generally, social costs are easier to think about in marginal terms i.e. marginal social cost. Marginal social cost refers to the total costs that the society pays for the production of an extra unit of the good or service in question. Mathematically, this can be represented by Marginal Social Cost (MSC) = Marginal Private Cost (MPC) + Marginal External Costs (MEC). Social costs can be of two types -- Negative Production Externality and Positive Production Externality. Negative Production Externality refers to a situation in which marginal damages are social costs to society that result in Marginal Social Cost being greater than the Marginal Private Cost i.e. MSC > MPC. Intuitively, this refers to a situation in which the production of the firm reduces the well-being of the people in the society who are not compensated for the same. For example, steel production results in a negative externality because of the marginal damages pertaining to pollution and negative environmental effects. Steelmaking results in indirect costs as a result of emission of pollutants, lower air quality, etc. For example, these indirect costs might include the health of a homeowner near the production unit and higher healthcare costs which have not been factored into the free market price and quantity. Given that the producer does not bear the burden of these costs, they are not passed down to the end user thus creating a situation where MSC > MPC. An illustration in which the marginal social costs exceed marginal private costs by the marginal external costs (or marginal damages). This is known as a negative production externality. This example can be better elucidated with a diagram. Profit-maximizing organizations in a free market will set output at QMarket where marginal private costs (MPC) is equal to marginal benefit (MB). Intuitively, this is the point on the diagram where the private supply curve (MPC) and consumer demand curve (MB) intersect i.e. where consumer demand meets firm supply. This results in a competitive market equilibrium price of pMarket. In the presence of a negative production externality, the private marginal cost increases i.e. shifted upwards to the left by marginal damages to yield the marginal social curve. 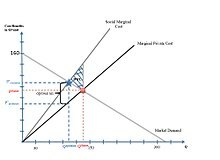 The star in the diagram, or the point where the new supply curve (inclusive of marginal damages to society) and the consumer demand intersect, represents the socially optimum quantity Qoptimum and price. At this social optimum, the price paid by the consumer is p*consumer and the price received by the producers is p*producer. The prospect of government intervention in regards to correcting an externality has been hotly debated. Economists like Ronald Coase contend that the market can internalize an externality and provide for an external outcome through bargaining among affected parties. For example, in the above-mentioned case, the homeowners could negotiate with the pollution firm and strike a deal in which they would pay the firm not to pollute or to charge the firm for pollution; the outcome pertaining to who pays is determined by bargaining power. According to Thomas Helbing at the International Monetary Fund, government intervention might be most optimal in situations where one party might have undue bargaining power compared to the other party. In an alternative scenario, positive production externality occurs when the social costs of production are lower than the marginal private costs of production. For example, the social benefit of research and development not only applies to the profits made by the firm but also helps improve the health of society through better quality of life, lower healthcare costs, etc. In this case, the marginal social cost curve would shift downwards and there would be underproduction. In this case, government intervention would result in a Pigouvian subsidy in order to decrease the firm's private marginal cost so that MPC = SMC. Quantification of social costs, for damages or benefits in the future resulting from current production, is a critical problem for the presentation of social costs and when attempting to formulate policy to correct the externality. For example, damages to the environment, socioeconomic or political impacts, and costs or benefits that span long horizons are difficult to predict and quantify and thus, difficult to include in a cost-benefit analysis. Another example that speaks to the difficulty surrounding the estimation of social costs is the social cost of carbon. In trying to monetize the social costs arising from carbon, one needs to understand "the effect of a ton of a greenhouse gas on global temperatures, the effect of temperature change on agricultural yields, human health, flood risk, and myriad other harms to the ecosystem". Analysts from Brookings Institution contend that one of the reasons the estimation of the social cost of carbon is incredibly complex is that the external costs imposed on society as a result of the transactions of one firm in China, for example, impact the quality of lives and health of consumers living in the United States. Heraclitus' idea that "change is the only constant" can also be applied to the understanding of the issues surrounding the presentation and estimation of social costs. Given that social costs are estimates and will always be subject to uncertainty, the assumptions made about the responses to policy, baseline social welfare, and predictions about the nature and number of affected parties are consequently imbued with a degree of uncertainty. Thus, estimates of social costs as of the present can never be known with certainty. ^ [http://www.frbsf.org/education/publications/doctor-econ/2002/november/private-social-costs-pollution-production/, "Federal Reserve Bank of San Francisco"
^ Pigou, Arthur C., 1920, The Economics of Welfare (London: Macmillan). ^ Zerbe, R. O. and D.D. Dively. 1994. Benefit-Cost Analysis: In Theory and Practice. New York, NY: Harper Collins. ^ a b "The social costs of carbon", "Brookings Institution"
Berger, Sebastian. 2017. The Social Costs of Neoliberalism - Essays on the Economics of K. William Kapp, Nottingham: Spokesman. Gruber, Jonathan. “Tobacco at the crossroads: the past and future of smoking regulation in the United States.” The Journal of Economic Perspectives 15.2 (2001): 193-212. Social Costs and Public Action in Modern Capitalism (2006), edited by Wolfram Elsner, Pietro Frigato and Paolo Ramazzotti, Routledge. Nordhaus, William D., and Joseph Boyer. “Warning the World: Economic Models of Global Warming.” MIT Press (MA), 2000. Hazilla, M. and R. J. Kopp. 1990. Social cost of environmental quality regulations: a general equilibrium analysis. Journal of Political Economy, 98 (4): 853-873. Gramlich, E. M. 1981. Cost-Benefit Analysis of Government Programs. Englewood Cliffs, NJ: Prentice-Hall, Inc.
Berger, Sebastian (9612), "The Discourse on Social Costs: Kapp's 'impossibility thesis' vs. neoliberalism", in Social Costs Today - Institutional Analyses of the Present Crisis, edited by Paolo Ramazzotti, Pietro Frigato and Wolfram Elsner, Routledge* Berger, Sebastian (forthcoming), "The Making of the Institutional Theory of Social Costs: Discovering the Kapp-Clark Correspondance", in American Journal of Economics and Sociology. Parry, Ian, W. H. , Margaret Walls, and Winston Harrington. 2007. "Automobile Externalities and Policies." Journal of Economic Literature, 45(2): 373-399.